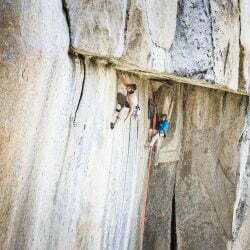 Most of the articles I write are aimed at improving performance in single-pitch rock climbing. Understandably, there are big questions when it comes to converting your single-pitch fitness into longer efforts such as big walls or alpine routes. When it comes to performing at a high level for a long day or days on end, a climber needs to develop work capacity. Work capacity is exactly what it seems; the ability to execute high levels of effort over time. When we talk about work capacity for climbers, we are talking about being able to consistently climb / work at a given level all day long. In a later article, we’ll discuss multi-day efforts. The concept of all-day fitness is easy to grasp. If you normally project and send 5.12a routes, you could easily consider climbing 10+ pitches of 5.7. But as the grades increase, your capacity declines slightly. 10 pitches of 5.10 might really push you. When it comes to your limit-level routes, 3 tries might seem like a lot. Work capacity training seeks to change that. If your goal is to do long free routes or even get more tries on a project at your local crag, there’s more to the equation than simply being strong enough to hold on to the holds. In fact, there is a limited amount of work capacity your climbing-specific fitness can handle. Your skin, joints, and hand strength all become limiting factors before your body’s physiological capacity is maxed out. Add to this that most of us have jobs and families, and just “climbing more” isn’t possible. In order to develop greater total work capacity for climbing, then, you have two choices: climb many climbs at a significantly reduced level or climb fewer routes at a slightly-below-max level supplemented with other forms of exercise. The latter is more fun, and probably more effective in the long run. The key to building work capacity is deceptively simple: do more total work. If you have some open time to train, or poorly allocated time (you know…Facebook), you can add more workouts to your plate. Instead of watching Narcos, you could hit the gym for another hour each week. However, if you are like me, you can’t just add training hours. Athletes working against a fixed number of hours each week can still increase their ability to do work, they just have to go about it differently. If you have, say, 5 hours to train each week, you can simply ramp up the difficulty of what you’re doing. Climb harder problems. Rest less between tries. In the weight room, up the weight, drop the rest periods, and accept the inevitable suffering that will come. Before you sign up for this kind of training, though, look at the name. Work. A great method of sneaking more work into your workouts is to break them up a little to keep the mind occupied and change the stimuli to the system. Be warned: training for climbing is nothing if not a world of compromise. Although blocking workouts together like this is fun and does build work capacity, your specific climbing strength and power may suffer. You’ll have to choose: do you want to climb your hardest, or do you want to climb a lot? This would be typical of a long training day. The shorter sessions can be blocked similarly, or can be sequenced throughout the week. We move from high-skill sport specific movements to non-specific, lower-skill movements as fatigue sets in. A huge error climbers make is to train limit-level climbing under fatigue…your body’s capacity to learn motor patterns is rolling whether you’re fresh or not, so don’t teach your body crap technique just to get a pump on. We build this training in 4-week cycles. It’s important to test yourself at the beginning with a performance test such as trying to see how many 5.11b-11d routes you can redpoint in a day. You can then repeat the test at the end and get some idea whether you’ve improved or not. We also have our climbers do an in-gym work capacity test at the beginning of week 1 and at the end of week 4. 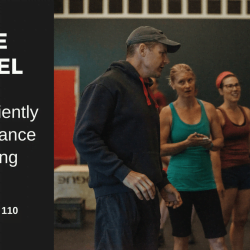 In the second part of this article, I’ll outline a 4-week work capacity training plan aimed at long routes, as well as detailing some of the sessions in that plan. Although I’ll give you a specific plan, the take home is that you have got to do more stuff each week until you can convert that to specific climbing capacity. Before you sign up for this kind of training, though, look at the name. Work. The fun part will not come until you’re done with the route and back at the car. The training is brutal and will, in the words of Jimmy Jewel, take all you’ve got if you’ve got what it takes.